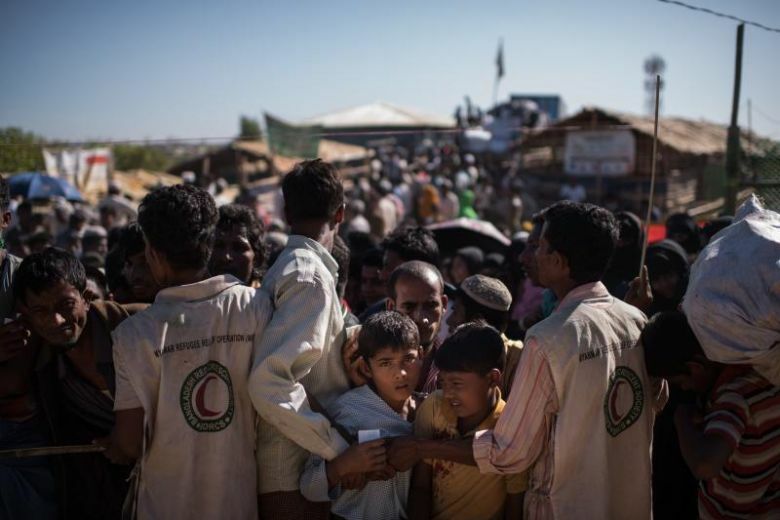 SINGAPORE - Rohingya Muslim insurgents who have fled Myanmar to seek refuge in Bangladesh camps may stage cross-border attacks, aiming at security targets and non-Muslims, the International Crisis Group (ICG) has warned in a new report. But the non-governmental organisation cautioned countries against imposing further sanctions on Myanmar, saying these are "unlikely to produce positive change". The report, "Myanmar's Rohingya crisis enters a dangerous new phase" published on Thursday (Dec 7), said the home-grown Arakan Rohingya Salvation Army (Arsa) militant group "appears determined to regroup and remain relevant" following its attacks on police posts and an army base in Rakhine state in August, which led to a security crackdown. While it has not launched any new attack since then, it "will undoubtedly strive to do so", the report said. Led by a network of respected local leaders, including young mullahs or religious leaders, Arsa has to date organised cells within hundreds of villages to try and start an uprising by sending large numbers of ordinary villagers to overrun police posts with farm tools, a departure from its previous approach of stationing uniformed, armed militants in camps, ICG added. "Yet operating under cover of the civilian population is no longer possible given that few Rohingya villages remain. Most of the group's organisers and fighters are now in the Bangladesh camps," according to the report. "The group may thus shift to cross-border attacks, which would require different training, access to weapons as well as operating space in Bangladesh," it said, adding it could aim at "opportunistic security targets in northern Rakhine or turn to attacking any non-Muslim villagers resettled on Rohingya lands, an easier target". The ICG warned that such attacks could escalate tensions between Bangladesh and Myanmar, potentially leading to clashes between the militaries of the two countries. They would also reinforce anti-Rohingya sentiment within Myanmar and prompt stronger security measures, which would hinder the chances of the return of the refugees. Furthermore, attacks against Rakhine Buddhists would inflame anti-Muslim sentiment and tip central Rakhine state - so far untouched by the recent violence - into crisis, the report added. Dr Subir Bhaumik, a consulting editor with Mizzima Media in Myanmar, told The Straits Times he did not agree that Arsa has a large number of organised cells led by respected religious leaders. He estimated that there are up to 30 squads in northern Rakhine who are "led by young radicalised alienated Rohingyas, some of them mullahs". "Respected Rohingya leaders have been terrorised into silence", he said, adding that the Arsa is seeking to eliminate Rohingya moderates. He agreed with the report that Arsa will shift to cross-border insurgency and draw Rohingya recruits from Bangladesh refugee camps. The group will also target non-Rohingyas, especially ethnic Rakhines, settled on Rohingya lands. "But the present government of Bangladesh is determined to not encourage Arsa because it has close links to its (Bangladesh) terror groups like JMB", or the Jama'at ul Mujahideen Bangladesh. The ICG also urged against imposing international sanctions against Myanmar over the Rohingya refugee crisis , saying the community should resist from disengaging from the country but instead maintain development assistance and non-military engagement. Policymakers should be "under no illusions" that the sanctions would bring positive change, but could only worsen the situation. "Their most likely effect will thus be to push the government, military and population even closer together and to reinforce current narratives in Myanmar that the West is a fickle friend and unreliable partner," the report said. Dr Oh Su-Ann, a visiting fellow at the ISEAS-Yusof Ishak Institute, told The Straits Times that assistance could come in the form of coordinating and facilitating, as well as providing programmes towards peace and reconciliation, as well as monetary donations especially to Bangladesh to help deal with the humanitarian crisis. She said: "It would help if the international community were to provide assistance to both governments of Bangladesh and Myanmar while reducing their overt criticisms, as these would only succeed in increasing the us-versus-them attitude in Myanmar."